Standing in front of a large audience, Costin announces his plans for Martinsville. Early afternoon, on Sunday, January 27, around 100 people came to hear what Republican Kenny Costin had to say as to why he is campaigning for mayor of Martinsville. Walking into the SCI REMC Community Room, everyone was wearing a name tag, and to the right of the room, there were t-shirts and campaign signs for everyone to have. Near the kitchen, there were desserts and water, and in the front left corner, a jazz band was playing while everyone mingled around. Kenny Costin is the owner of Costin Funeral Chapel and is very well-known in Martinsville. As a long time resident, he wants to see some change in the city he loves. Costin was born and raised in Eminence; he attended Purdue University but graduated from Mid-America College of Funeral Service in 1982. He is a conservative Republican and a Christian. In Costin’s announcement party speech, he said that he wants to address Martinsville’s issues as a whole community; he wants to help Martinsville grow in ways that will help everyone. Many people in this community are not fond of change, but in order for Martinsville to grow and still exist, change may be the only option. Costin also mentioned how he wants new sidewalks for all of Martinsville, not just in certain areas. In addition, he wants to bring in a few new businesses that everyone will love, which will hopefully open up more job opportunities. 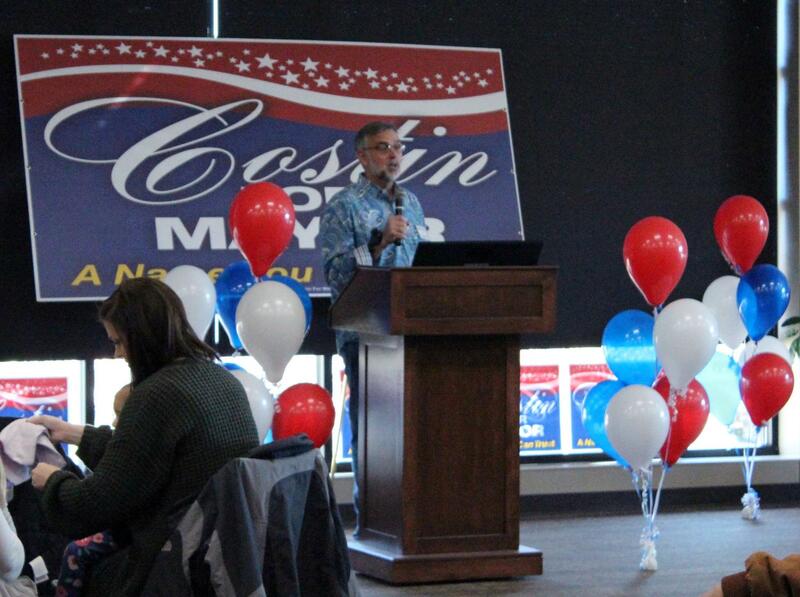 Costin has announced that he is running as a Republican. Running against him, on the Republican side, will be Kevin Coryell. On the Democrat side will be Tom Wallace. The last day to sign up for the primary election is February 8th. All seven seats for Martinsville City Council are up for re-election; as of right now, they are all Republicans. The primary election will be on May 7th, and that will decide who will be on the ballot for November. The general election will occur in November. Show up at the polls to support who you think should be the next mayor of Martinsville.